When I went to check on the Valerian seedlings by the kitchen door, the plants in one container stood like a well drilled platoon. In the other, they had collapsed at one end. ‘That’s strange,’ I thought. ‘Perhaps I forgot to water them.’ It’s really difficult to kill Valerian. The original seeds had come from gran’s garden years ago. It is a good value plant that will grow on rocky outcrops or in poor soil like the sand in my garden. With hot summers and hosepipe bans, my plants have to be tough. I do spread homemade compost but this disappears like peas in quicksand and I know I’m in trouble when even the weeds won’t flourish. Valerian seems to cope and rewards with flowers every year. I set off down the garden to a sunny spot with the collapsed seedlings and pushed my trowel into the middle of the container. 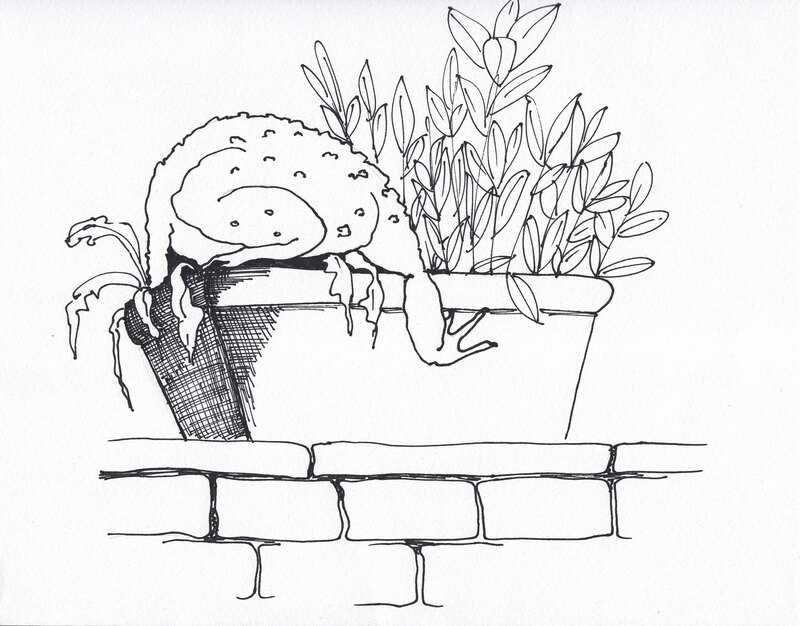 ‘Bufo bufo – you sneaky toad!’ I screamed as I unearthed the warty beast. In the dead of night he must have crawled into the trough and settled under the leafy quilt to hibernate for the winter. He’s done this before several times and I’m not sure who is more disturbed by the encounter. I always try to rehome him but I know he never likes my choice of abode and crawls off in disgust as soon as I put him down. I do appreciate his appetite for slugs and snails but in the autumn I’m afraid to push spade into earth for fear of the damage I might inflict. I understand the toad can live for forty years or more, so unless the snake finds him before we move house, I shall have to be more careful.